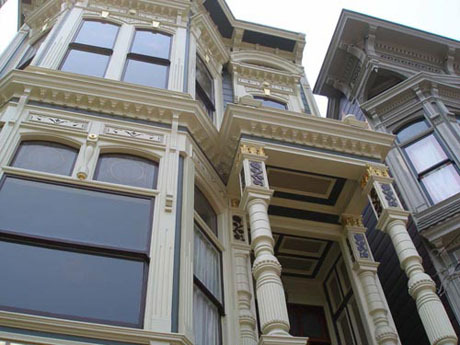 The project is an 1890 San Francisco Victorian house. Over the years it has been through a lot. Its seen two massive earthquakes, a series of negligent owners, and a whole lot of ugly wallpaper but its still standing. Luckily, my housemate and I are here to restore it to its original grandeur with some updated amenities as well. When we got it, it had recently been converted back into a one family home as it was originally intended. At some point along the way, it was converted into to separate units and a lot of that can still be seen all over the house. For example, the kitchen is on the second floor! The previous owner decided to remodel it there rather than bring it back downstairs but thats another story for another post. There are also still two gas meters as well as two electrical boxes. Its going to take a lot of work to bring it back to its original glory but we’re up to the task. Hopefully over the years we will be able to discover more about the house’s history but its going to be a challenge. After the 1906 earthquake a massive fire ensued and burned almost all the records of the home. The only records that remained were the water records which were stored in another location. Thats the only thing linking this house to the year it was built, 1890. So stay tuned as we document the houses history, renovation, and hopefully its rich history though all the years its been sitting on this hill. so excited to stumble upon your blog today! i was searching for inspiration photos of sf victorians with garages (soon need to start planning for a new foundation and garage addition) and google suggested i take a look. love your how-tos and that your renovations are in keeping with the spirit of the place. good luck with all of the work – i’ll definitely be following your progress!